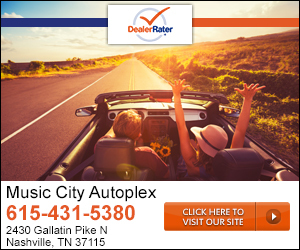 The Best Used Cars, Trucks, and SUVs from a Nashville-Area Dealership You Can Trust Welcome to Music City Autoplex, a new kind of used car dealership serving the Nashville area. You won't find any of the typical stereotypes you think of when you hear "used car salesmen" here at our dealership, as our salespeople have one goal only - your complete and total satisfaction. We want to provide you with the same kind of shopping experience that we would want when searching for a used car, so everyone that works for us is courteous, professional, and trustworthy. When you choose Music City Autoplex, you can always shop with confidence knowing you're getting the best deal on the highest quality used cars in the Nashville area. DO NOT SHOP HERE!!! Worst experience of my life! They sold me and imported jeep from Canada without telling me which voided all the factory warranties and recalls. I had to fight them for a month to get them to fix it. (The only reason I got the jeep fixed was because Bob Frensley messed up and fixed the jeep without anyone’s permission.) They also sold me a full Extended warranty but when it came time to use it, it only cover the air-conditioner. They would not honor their warranty. I was forced To sell my dream vehicle that I dumped thousands of dollars into upgrading and couldn’t get repaired because I was laid to face to face by this dealership. The only reason I went back to this dealership is because I was thinking they would give me a fair price for my vehicle since they lie to me and screwed me over so bad, which they didn’t. I had no choice but to buy a vehicle that day that ran for being at risk of losing my job. They sold my Jeep a few days later that they told me they sold to another dealership which was a lie, that never happened. The owner of my old Jeep tracked me down to ask if anything was wrong with it when I sold it. I told them everything that was wrong. These people never fixed it! They sold it with a bad transmission just a few days later. They KNEW it was bad! The BMW I bought they agreed to tent the windows and I got it back with the cracked front windshield. But because I didn’t take pictures of the windshield before they took it there’s no proof! One week after I bought the BMW the door locks me in and I have to climb out pastor side. I showed them 5 videos of it doing this. They tell me nothings wrong with the car sorry about your luck. If this is how this dealership knowingly treat a disabled veteran just think about how they’re going to treat your wife or your daughter. There is no integrity in this dealership even though that’s what they base their business upon in their commercials. "Wonderful people, great cars, great deals, SHOP HERE!"